MacPhun is the company behind Tonality, Intensify, Focus and other Mac photo-editing apps now bundled together into the MacPhun Creative Kit 2016. 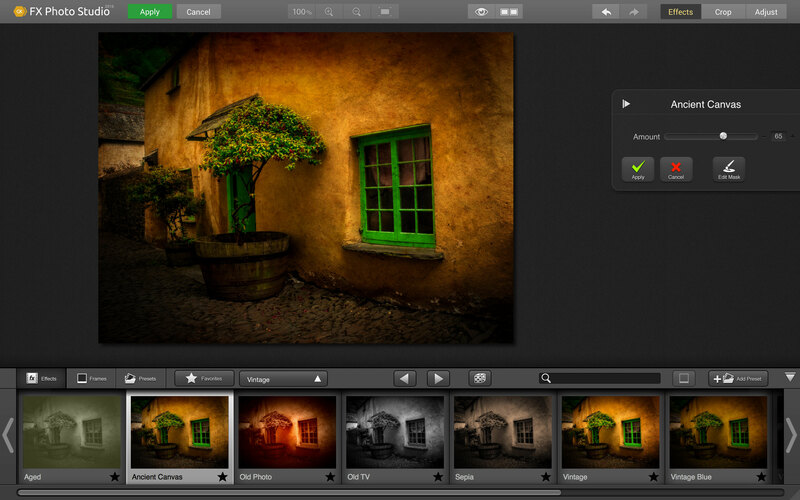 MacPhun also publishes Aurora HDR in conjunction with travel photographer and high dynamic range guru Trey Ratcliff. It’s just been updated to Luminar 1.2 ‘Neptune’ and boasts a series of improvements and enhancements over the previous ‘Pluto’ version. It costs $59/59€/£55/AU$84 for all new users or $49/49€/£46/AU$69 for anyone who already owns any Macphun photo software. Free trials are available at macphun.com/luminar. 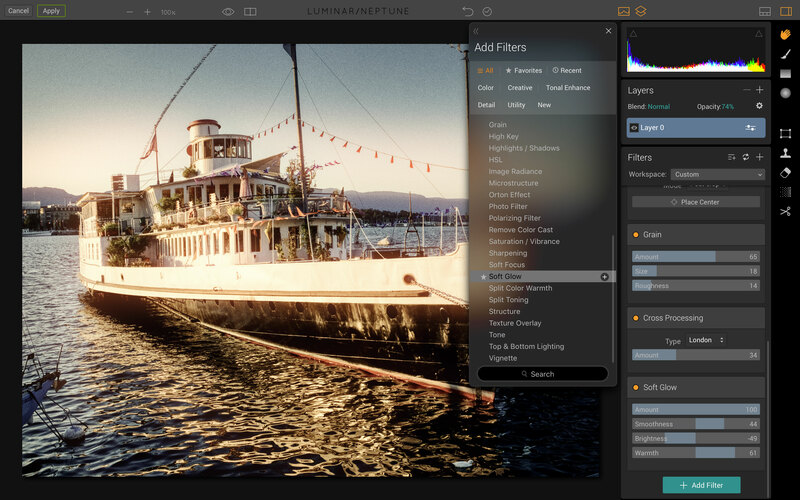 The company’s name suggests that MacPhun makes software exclusively for Apple Macs, but its other big news is that Windows versions of Luminar and Aurora HDR will arrive later in 2017. A public beta will be available from July 2017. Luminar can be used as a standalone application. When you launch it, you see a simple window that prompts you to load an image to work on, or a whole series of images for batch processing. Luminar doesn’t have any photo browsing tools built in, however, so this isn’t the easiest way to use it. Most Mac owners will probably be using Apple Photos or maybe Lightroom to organise their images, and compared to this locating photos in a Mac Finder window is a bit old school and low-tech for today’s photographers. Luminar’s welcome screen has buttons for opening individual images or batch processing. You can also use it as a plug-in from within other apps. 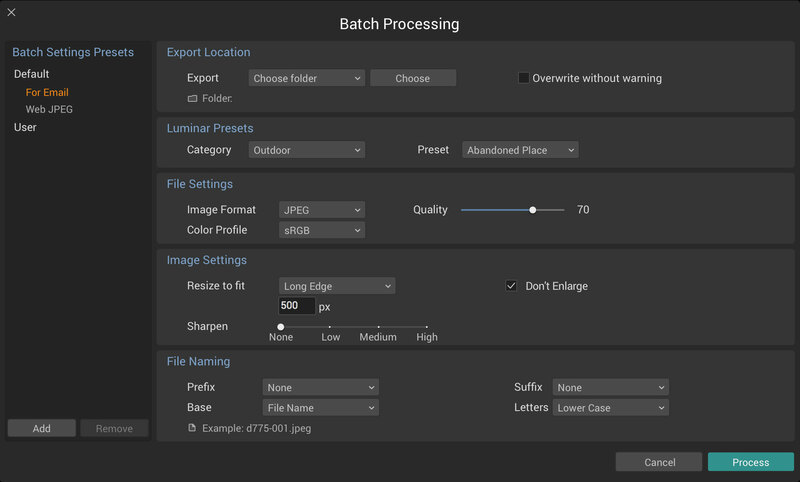 If you already know the look you’re going for, the file format and the image size, Luminar’s batch processing option is ideal. Luminar also works as a plug-in for Lightroom, Photoshop, Elements and Aperture, however – yes, Aperture is supported. It’s nice to see MacPhun still has some faith in Apple’s terrific pro photo management software, even if Apple doesn’t. So if you use Lightroom to organise and view your photos, you can send them to Luminar for editing just as you would any other plug-in effects filter or external editing app. It even installs as an extension for Apple Photos. Luminar can open and edit RAW files directly. It did a decent job with many mainstream camera RAW files but struggled with the colour balance of the EOS 800D’s raw images and didn’t apply lens distortion correction with our Fujifilm X30 compact, Panasonic FZ200o or LX15, cameras which normally have lens corrections ‘baked into’ the RAW files. If RAW files are an integral part of your workflow and you rely on them for maximum image quality, then, you might be better off carrying out your RAW conversions in another app first. It looks as if Luminar still has a little way to go here. Luminar can open RAW files directly, but our results were inconsistent. It didn’t apply lens corrections to our Fujifilm X30 image (top) and the colour balance was way off in this Canon EOS 800D RAW file (above). Luminar is is an image-editor with a difference, in that you don’t see all the tools at once. Instead, it uses ‘workspaces’ containing just the tools you need for different kinds of photography. Each workspace is simply a collection of filters for a specific photographic genre. Luminar 1.2 comes with six workspaces as standard: ‘Quick & Awesome (new), ‘Essentials’ ‘B & W’, ‘Landscape’, ‘Portrait’ and ‘Street’. Each workspace displays a smaller subset of the full set of filters, so the ‘Landscape’ workspace, for example, includes the ‘Color Temperature’, ‘Tone’, ‘Saturation/Vibrance’, ‘Polarizing Filter’, ‘Foliage Enhancer’, ‘Clarity’, ‘Structure’, ‘Image Radiance’, ‘Top & Bottom Lighting’, and ‘Vignette’ filters. Yes, that sounds a lot, but if you decide this Landscape workspace is too complicated, you can hit an ‘x’ button to delete the filters you don’t need to make it simpler – and then save a new, custom workspace of your own. 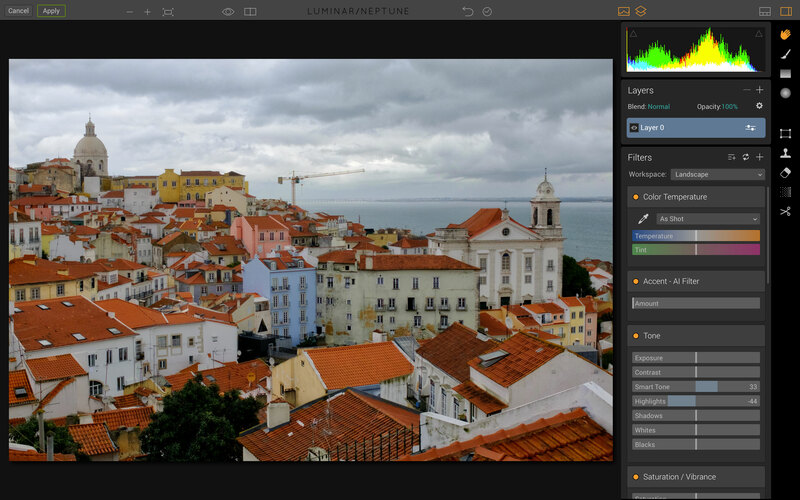 Luminar uses ‘workspaces’ to offer a simplified interface for different genres of photography. 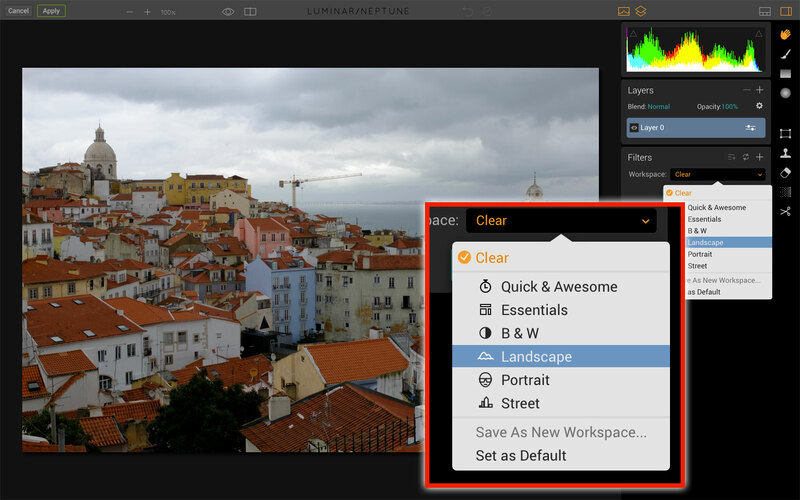 The Landscape workspace offers the Filters most often used for enhancing outdoor shots, for example. This is MacPhun’s way of making your Luminar experience as simple as possible. You could even approach it the other way around and start with the ‘Clear’ workspace option which has no filters at all, and then add the ones you want, one by one. 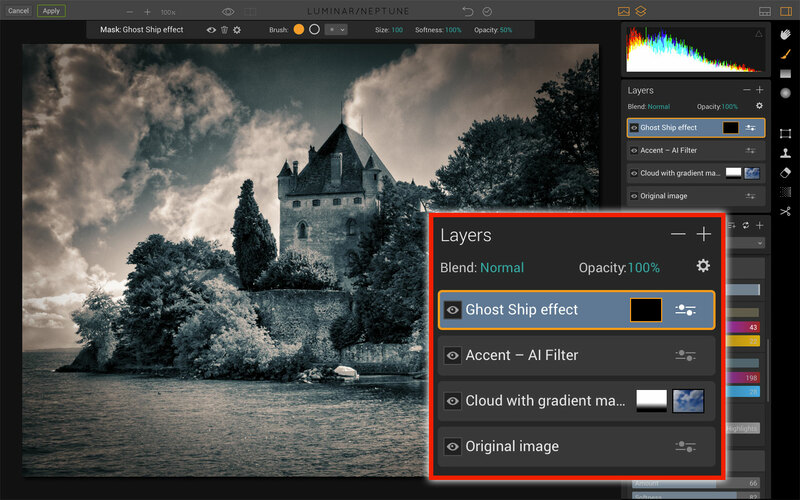 These filters do a whole range of different things, from regular adjustments like Brightness/Contrast, Curves and Sharpening through to effects like Dehaze, Foliage Enhancer and Polarizing filter. There are 41 filters in all, including a new Accent – AI filter which uses artificial intelligence to split your images into different areas and optimise the colour, contrast and structure for each one. As an instant fix this new filter works pretty well, equalising shadow and highlight detail in high contrast scenes and adding definition, especially in skies. It does bump up the saturation rather a lot, but you can fix that by adding the Saturation/Vibrance filter. The Luminar Vignette filter has been improved too, with new vignette styles (Highlights Priority or Paint Overlay), a Place Center button for positioning the vignette anywhere in the frame and new Pre- and Post-crop options. The new Accent – AI Filter uses artificial intelligence to enhance your photos automatically. The improved Vignette filter lets you place the centre of the vignette effect wherever you like. You don’t have to get straight into workspaces and filters because Luminar offers a whole range of preset effects made using different filter combinations, and these are displayed in a filmstrip along the bottom of the screen. You can choose different preset categories using a button at the right hand end, for example ‘Basic’, ‘Street’, ‘Outdoor’, ‘Portrait’ – MacPhun does periodically release additional preset packs from photographers. To apply one of these preset effects, all you have to do is click it. Then, over on the right hand side of the screen, you can see the adjustments that have been made in the tools/filters panel. 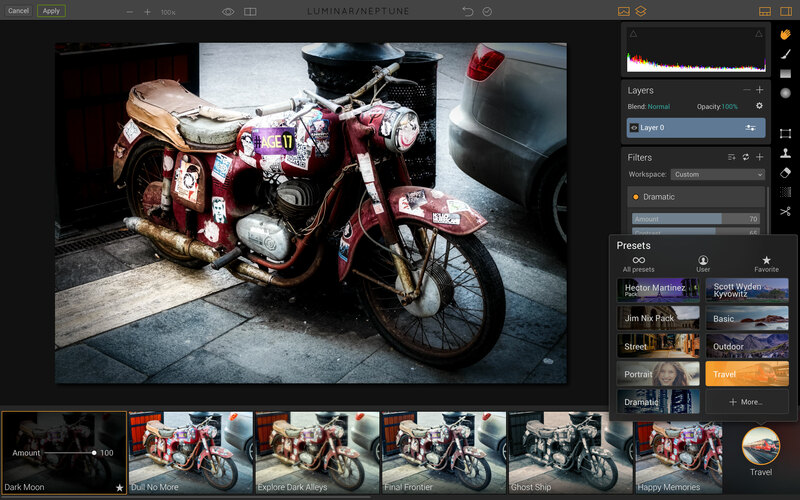 Luminar comes with a selection of one-click presets, and it’s easy to add your own. This is the standard way of applying and adjusting preset effects in modern apps. You get to give your photos an instant ‘look’ with a single mouseclick, and then you can tweak the settings as much as you like to refine it or even create your own. Over on the far right of the screen is a vertical tools panel. At the top is a small collection of masking tools (more on those in a moment) and underneath is a clone stamp tool for blotting out unwanted objects, an erase tool for content-aware object removal, a denoise tool for cleaning up high ISO images and a crop tool. 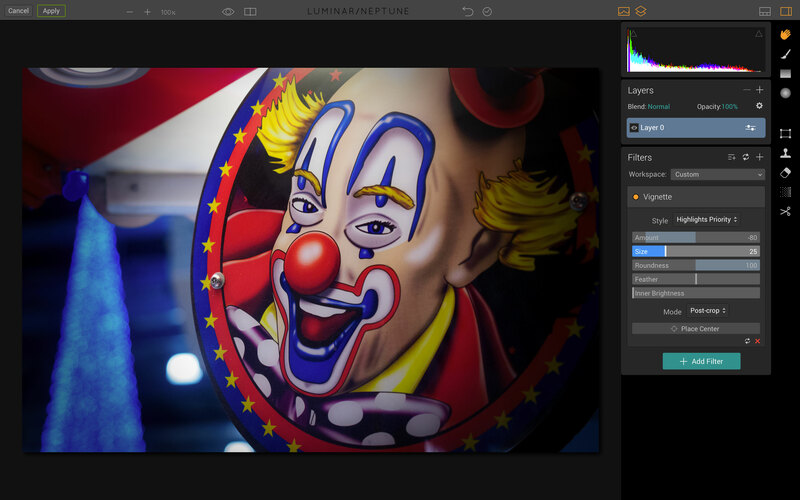 Luminar has a noise reduction tool which offers preset noise reduction types and a strength slider. Now these aren’t massively sophisticated, but they are quick and effective. The clone stamp and erase tools lack the sophistication and control of Photoshop’s equivalents but they do a decent enough job, and the denoise tool has preset options that look a lot like those in MacPhun’s separate DeNoise program, though without the in-depth adjustments. But if these retouching tools are a pleasant surprise, the layering and masking options are going to really make you smile. This is a very pleasant surprise in a program that might have started out looking like a regular image effects tool. Luminar can not only ‘stack’ effects using layers, complete with opacity settings and blend modes, it also has a masking brush, radial and gradient mask tools for blending in these layers in specific areas. This is done using ‘adjustment layers’ – but MacPhun takes one more unexpected step by offering image layers too. You can actually combine different images using this software, which makes it a very effective all-round image-manipulation tool. The masking tools lack the precision and sophistication needed for pixel-perfect cutouts and composites, but for subtle blends and multiple-exposure effects it’s fine. Luminar doesn’t have the precise selection tools needed for pixel-perfect masking and cutouts, but it’s still possible to combine image layers and effects in very creative ways. This is where Luminar is a step ahead of other image effects tools, and it elevates it into a powerful all-round image-editing and manipulation tool. MacPhun says the Brush, Gradient and Radial Gradient tools are now much faster, and that memory management has been improved too. Even so, my 13-inch MacBook Pro Retina did get bogged down processing some of Luminar’s more complex effects, though it’s no ball of fire with other sophisticated effects tools like the Google Nik plug-ins either, so it’s probably time I looked at an upgrade. 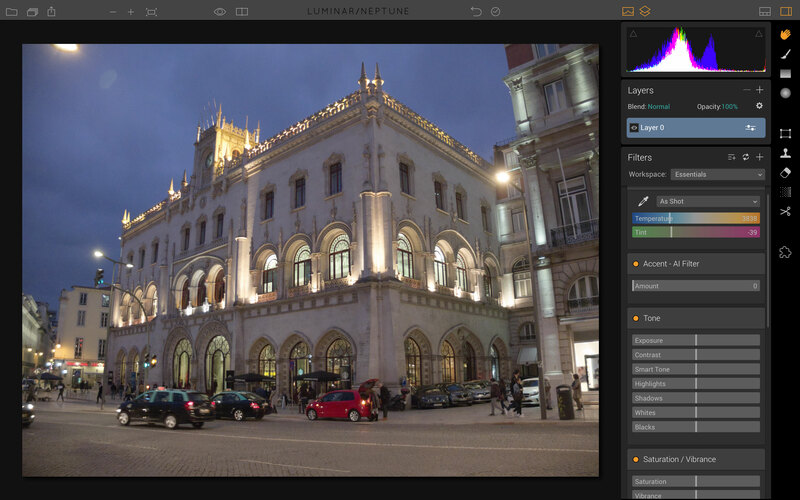 The other piece of significant news in Luminar 1.2 Neptune is support for MacPhun’s existing Creative Kit plug-ins. Although these are older products unlikely to be developed further now that Luminar is on the scene, they do still offer features and tools not yet available in Luminar, or present but only in a less powerful form. This is also a way for owners of the Creative Kit plug-ins to still get some use out of them even though, technically, they’ve been superseded by Luminar. The Tonality plug-in, for example, is excellent for black and white analog effects (and colour too), while Intensify can restore dramatic depth and detail to flat-looking images. Noiseless and Snapheal are handy for noise reduction and object removal respectively, and while the image effects in FX Studio are sometimes on the wild side, they can act as a really good trigger to the imagination. 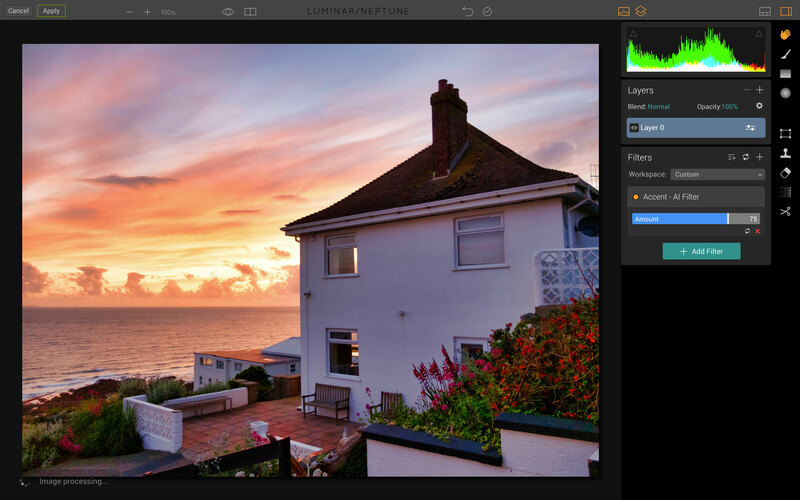 Luminar now supports MacPhun’s own Creative Kit plug-ins to further extend its capabilities. This is FX Photo Studio. This Creative Kit plug-in support is well implemented. When you pick a plug-in from the menu, the image is opened in that plug-in with all your Luminar adjustments applied, and when you Apply your plug-in adjustments, the image is saved back to Luminar as a new layer, with the original image layer(s) intact below it. You can then adjust the plug-in effect layer’s opacity, blend mode and masking. We did notice, though, that the plug-in support was not available when Luminar itself is being used as a plug-in, for example from within Lightroom. You can only use the Creative Kit plug-ins when using Luminar as a standalone program. The Luminar interface is simple, elegant and classy. You can choose just the filters you need to create your own customised workspaces, though it would be even better if you could collapse each filter to just its title bar and show only the filter/tools you’re using right at that moment – it would make that tools panel even cleaner and simpler. And perhaps the preset effects supplied as standard don’t quite reveal this software’s full potential. Many of the preset effects are on the mild and subtle side, and the software certainly seems capable of a much wider range of ‘looks’. 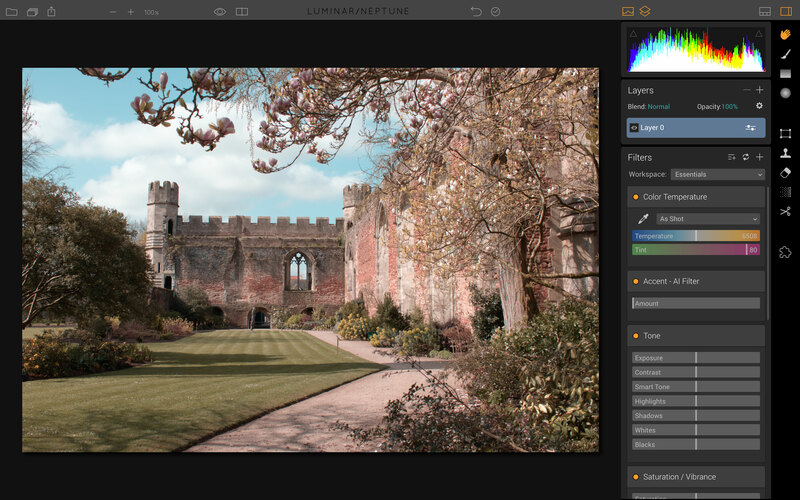 Now with 44 different filters to choose from, Luminar can deliver an ever-growing range of image enhancements and effects. A bokeh filter would be nice, and maybe some border effects and other ‘analog’ filters – this is the kind of thing you get in Google’s Analog Efex Pro, ON1 Photo and Alien Skin Exposure X2, and for the moment Luminar relies on MacPhun’s other plug-ins to get these looks. But Luminar has come a long way in a short time, and there’s no doubt a lot more in the pipeline. It’s priced pretty keenly and its ability to run as a standalone app, plug-in or Apple Photos extension is a real bonus. All it needs now is some kind of image browsing/cataloguing capability, a few more analog effects and perhaps some more sophisticated selection tools. Alien Skin Exposure X2 and ON1 Photo RAW 2017 offer both of these things, but they are more expensive. With the Windows version coming soon, it does seem as if Luminar is gaining some real momentum. Thanks for this review Rod. I’ve pre-ordered Luminaire as I feel rather let down by Adobe. I’ve had Lightroom since version 1, and have upgraded twice so that I now run version 5. I need to run it off a new computer now but Adobe won’t let me make the switch because I can’t find the serial number of the middle upgrade (made several years ago with two house moves in between). I was attracted by Luminaire’s functionality and also the fact that I can run it off several machines (my lap top and two desk tops). However, I confess I like Lightroom’s library and cataloging – its digital asset management. So the lack of an equivalent is a concern. If I have to buy a new copy of Lightroom to be able to run the library off my new computer, then I need not have purchased Luminaire. So – is there an alternative that you suggest? Is a MacPhun library / cataloging add-on for Luminaire in the wings? Something is coming, Alan. I’ve had a conversation with MacPhun about this before and I’ve just asked for a statement. Stand by! as a starter (even at my 70+ age!) I think I will be trying LUMINAR. For people like me, with good camera equipment but not experienced in advanced and more complex tools lik Adobe Photoshop I hope you keep remembering to make things not too difficult. .if so….I’m one of your buyers and….keepers! At my age, 70+ , owning a MAC and a good OLYMPUS OMD camera, but not an experienced photoshopper, just looking for a good but simple Mac photo-editing standalone program: maybe your LUMINAR is the right choice! Keep it affordable, simple and…I’m your buyer! Just for the record, I have no connection with MacPhun – I’m a journalist and I write about all image-editing software. Does it work well with jpeg as well as raw. I download my photos to the photos icon on my mac. Is it easy to import and export? Sure, works with jpegs and can convert them to other formats as well. If you use Photos for Mac, Luminar can work as an extension to quickly export and import. About photoshop, I fell would be nice to have rapid corrections, like Ctrl+upcase+L or M, to get automatically a rapid correction, and later make finer corrections. Looks like great product . Any idea when it will come as a PC version? This version already includes some of the key features of Luminar and we are working towards the final release in the end of the year. Just started using Luminar and I can see a problem already. It takes to long to load a raw file, any changes to the photo is time consuming. I saved the photo once I was tired of working on it to the desktop. I then opened up photoshop and tried to load the picture. I wanted to finish doing what I needed to do to the photo but Photoshop does not recognize the file that Luminar saved the picture in. I had to go back to the original raw file and start over. I did what I wanted to do in a third of the time. I have over a 100 photos from a shoot last Saturday. I do not have time to use Luminar to process them. I did remark in the review that Luminar’s RAW processing is not particularly good at the moment. When you make changes to an image Luminar will save them in its own format so that you can go back later and make further changes, but this does mean Photoshop will not be able to read Luminar’s files directly. This is normal and not a fault with Luminar – other image editors use their own unique file formats too. To open your edited photos in Photoshop you will need to export them from Luminar as a TIFF or a JPEG file. I have a 5 yer old Mac computer that has a photo editing app with most of the same features as Luminar. It works very well and I had hoped that by upgrading to Luminar, I would be adding many new and different features. 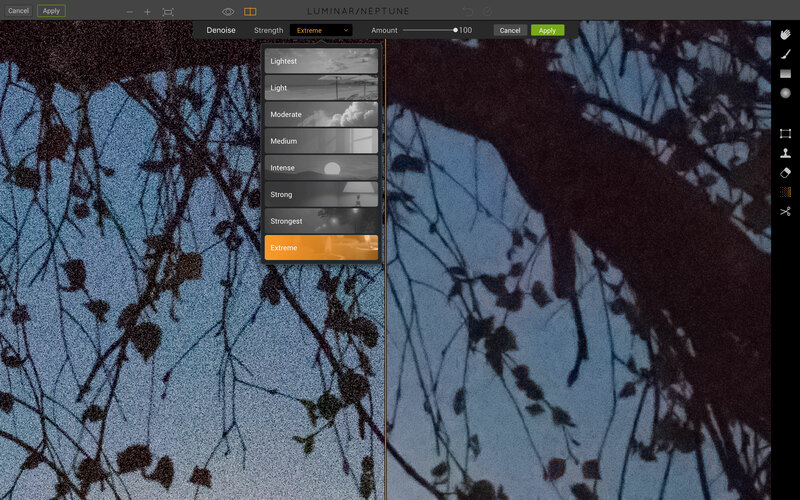 Unfortunately so far I am disappointed as Luminar seems so much slower, which I find frustrating. I am also annoyed at the numerous articles featured, trying to get me to purchase something additional, to what I already have. I find these in your face “buy-me, buy-me ads, quite annoying every time I open your program. I am going to try to upgrade my Mac to see if I can get Luminar to operate faster. I will let you know if I am successful. Meanwhile include many of those different or new features into the Luminar program instead of constantly trying to get us to buy something else. I discovered Luminar when I upgraded to my Canon 5D MK1V and discovered that my old copy of photoshop wouldn’t open the RAW files. Faced with upgrading to a subscription to Adobe Creative Cloud (I hate subscriptions) I tested Luminar. I’m generally impressed, so I’ve ordered the new version which is about to be released.